During the descent, CONSERT operated for about 6 hours during the descent, until about 50 minutes before the planned touchdown. 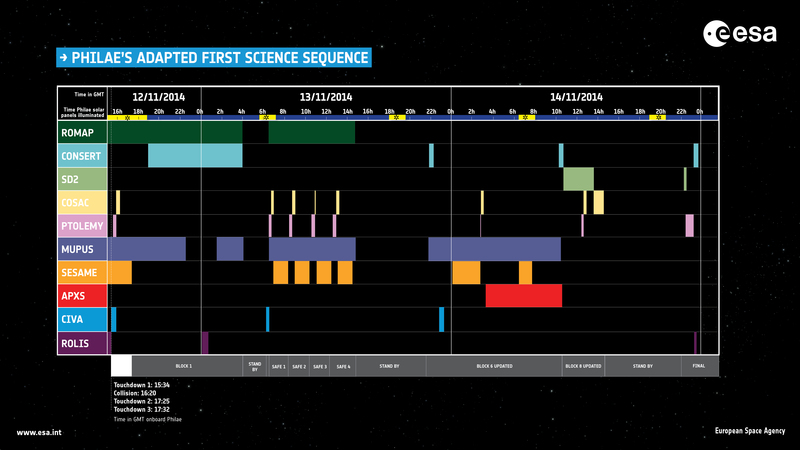 The measured distance between Rosetta and Philae corresponded to the planned one, which meant that during the descent we knew that everything went smoothly. The CNES team used these data for the reconstruction of the lander descent trajectory. Although the total amount of data collected – 32 Mbytes – is rather small, we need to run 3D computer simulations with ‘heavy’ comet shape models that generate 100 TBytes of temporary data in about 1 million total CPU-core computing time in order to interpret these measurements. In spite of Philae’s CONSERT antenna ending up in an unfavourable configuration when it finally came to rest in Abydos, we still made successful operations, and made some interesting scientific discoveries. For example, the value of the dielectric constant derived from CONSERT data is very low and typical of an extremely porous medium. We could also infer that the upper part of the small lobe is fairly homogeneous, down to a scale of several metres. Thanks to CONSERT data and improved comet shape models that have been produced since Philae’s landing by the OSIRIS team, we could also refine our estimate of where Philae could be. Now,Philae has been finally imaged on the surface and confirmed to be within the boundaries of our original prediction. Knowing the exact position and close environment of the lander, we will be able to start interpreting the amplitude of our signal data in addition to the radiowave pure travel time analysis. 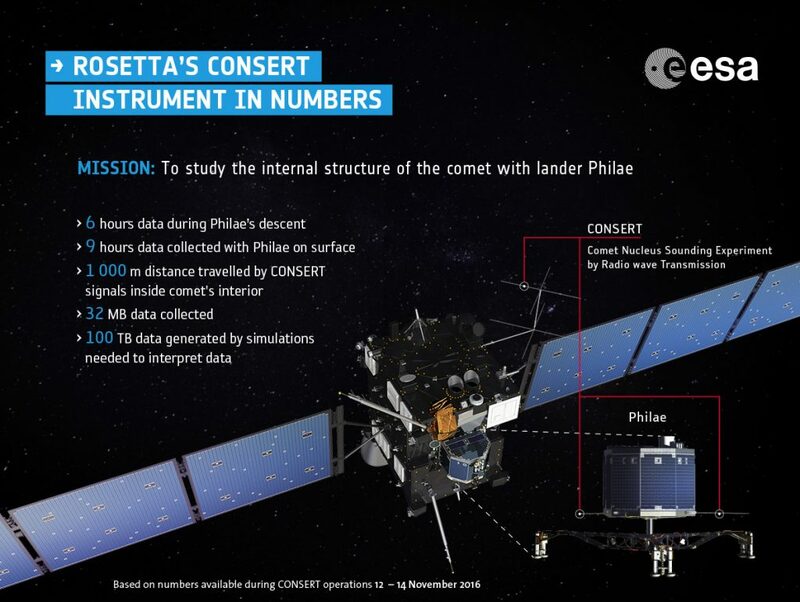 CONSERT is an innovative instrument built especially for the Rosetta mission, to study the cometary interior. After the successful study of the interior of the comet, CONSERT-like radars are now being proposed for future small bodies missions such as AIM. 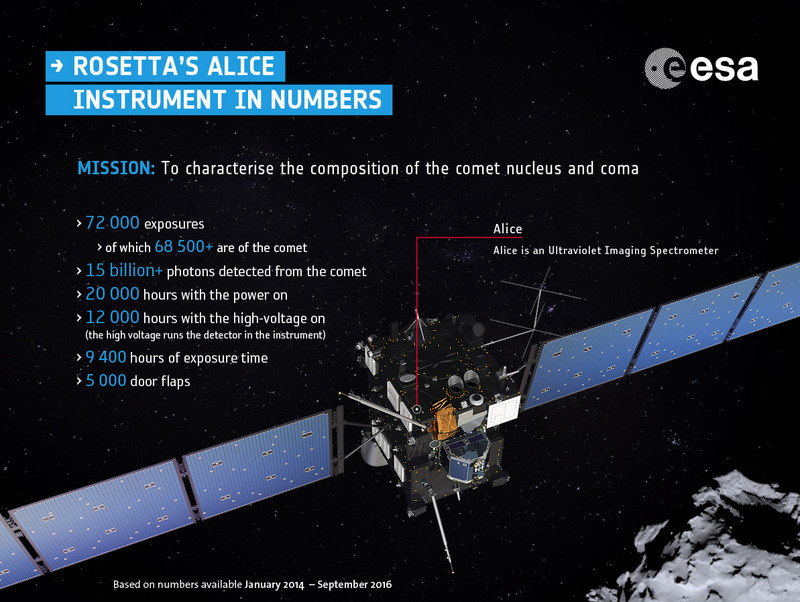 Rosetta’s Alice was the first of the “Alice” line of ultraviolet spectrographs (UVS). Since then, various Alices have flown to different corners of the Solar System: Pluto (on New Horizons); the Moon (on the Lunar Reconnaissance Orbiter – the UVS is called “LAMP”, the Lyman Alpha Mapping Project); Jupiter (on JUNO, the instrument is simply the UVS), and more are in development for missions to Jupiter (such as ESA’s JUICE mission) and Europa – its legacy will live on. -learning how the Alice detector can be used to measure dust and particle activity around the comet. Alice has only a few moving parts. A couple of them can move only once, e.g., the door covering the detector is a spring-loaded door that we opened early in the mission and is stays open forever. But there is only one part that moves more than once, and that is the "aperture door" that is near the front of the instrument. It usually is closed when Alice is not observing. It protects the inside of the instrument (the sensitive optical surfaces and the high voltage detector) from dust and gas from the comet or the spacecraft thrusters, and also from too-bright objects. So, for example, if the spacecraft will be firing thrusters, we close the door and wait 30 minutes for any residual gas to dissipate before opening the door and turning on the high voltage. If GIADA reported a dust environment that got too high, we could close the door, but the dust never got that intense, as far as Alice is concerned. It is generally a good idea for space instruments to minimize the number of moving parts because those are at the highest risk of failing or breaking, and you can't send up a handy repairman to fix it when it breaks. So we are careful to monitor the number of times we open/close the door and also occasionally test it to see if it seems to be getting “sticky” or misbehaving in some way that might indicate an impending failure. The door on Alice was rated for at least 10,000 “flaps” (open/close cycles), and that number gives a factor of two buffer relative to ground tests. Rosetta’s Alice had about 5,000 flaps through the course of the mission, but the record-holder is the LAMP UVS instrument on LRO, which so far has made over 80,000 door flaps! If the Rosetta-Alice door did get stuck, there are various options we could have considered. If it got stuck open, we probably would have left it open; it would have increased risk of contamination, but if we continued to try to close it, there would be the risk that if it did close, it then would be stuck closed. If it got stuck closed, we had a small “failsafe” door that is a open-one-time door below the aperture door that would still have allowed about 10% of the light to get through, so we could still keep doing Alice science, through with reduced sensitivity. A spacecraft sensor attached to an external foot of Alice measured the temperature of the instrument throughout the entire mission (Rosetta’s distance from the Sun is indicated along the bottom). The gap in data corresponds to the 31-month period of deep space hibernation when no temperatures were recorded, and we don’t know how cold it got! After hibernation, Alice and the spacecraft started warming up again, and then we adjusted our standard operations to run Alice with the heaters always on, which helped to stabilize the temperature. 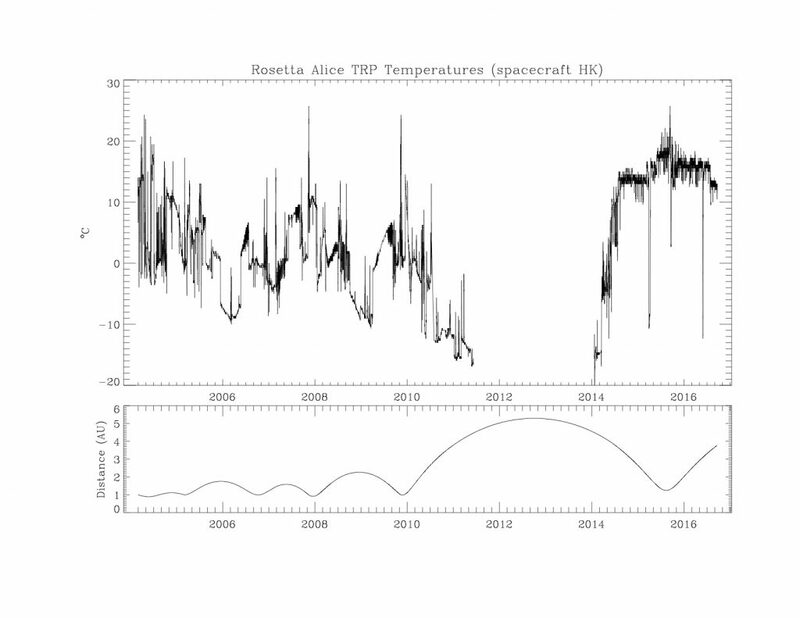 Sudden spikes in the data are attributed to changes in the spacecraft attitude, depending on whether the side of the spacecraft with Alice on was pointed towards the Sun or away. Image courtesy Joel Parker. He recalls a few such problems and false alarms: “For example, Alice autonomously shut down when it received data indicating the pressure of the gas around the spacecraft might have increased to levels too high to operate, but as it turned out, the pressure values reported to Alice were incorrect – although in the space business, it is better to be safe than sorry! Another time Alice’s computer mysteriously rebooted – an event that happened only twice during the mission. “At other times, Alice stopped running exposures because a “too bright object” came into the field of view. The first time that happened, it turned out that it was a bright star and Alice’s internal safety checks correctly “safed” the instrument. 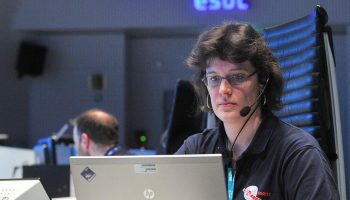 As Alice orbited 67P, such bright stars (the Alice team called them “bad dogs”) would frequently cross Alice’s field of view, so to avoid frequent 1:00 am phone calls to the Alice team, operations were modified to account for such situations, and Alice would automatically recover and continue operations once the “bad dog” went away. 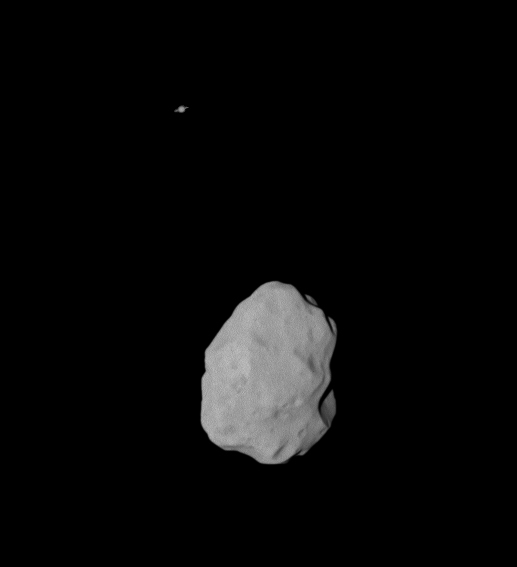 So while I was preparing for Lutetia flyby in summer 2010 , I was using a software package called Celestia to try and picture a bit what was happening. Doing so, I realised the software – which is pretty accurate – was showing me that, as we were approaching the asteroid, Saturn was just in the background. In fact, the software suggested a conjunction situation, in which the asteroid would lie between the spacecraft and Saturn! In other words, it was showing that the view from Rosetta to the asteroid would have Saturn in the background! Now I know that this kind of simulation should be verified with care, so I contacted a colleague, Michael Küppers, at the Rosetta science operations centre, at ESAC near Madrid, who was dealing with spacecraft pointings and who knew a fair bit about our scientific camera. I asked him if he could confirm what I was seeing – and whether it would be possible to take a picture? Saturn was very far and dim, Lutetia was very close and bright, and my Celestia software was not capable of determining whether Rosetta’s camera could successfully get such a photo. After looking at it, Michael confirmed that it was indeed feasible, and the imaging request was added to the spacecraft commands to be sent up near the time of flyby. The resulting image (see below) is one of which I am very proud, and I could not believe that no one else had noticed this conjunction!